This new XP-10-HD (Heavy Duty) Kit is not intended so much for motorcycle or ATV use because the clamps are larger and the case is larger. The Antigravity's New Micro-Start XP-10-HD kit is perfect for mechanics and commercial or daily use. It includes the HEAVY DUTY Smart Clamps featuring a larger, stronger jaw and unbreakable All-Copper construction. The Micro-Start XP-10 is unrivaled for performance & quality in the mini jump-start segment. 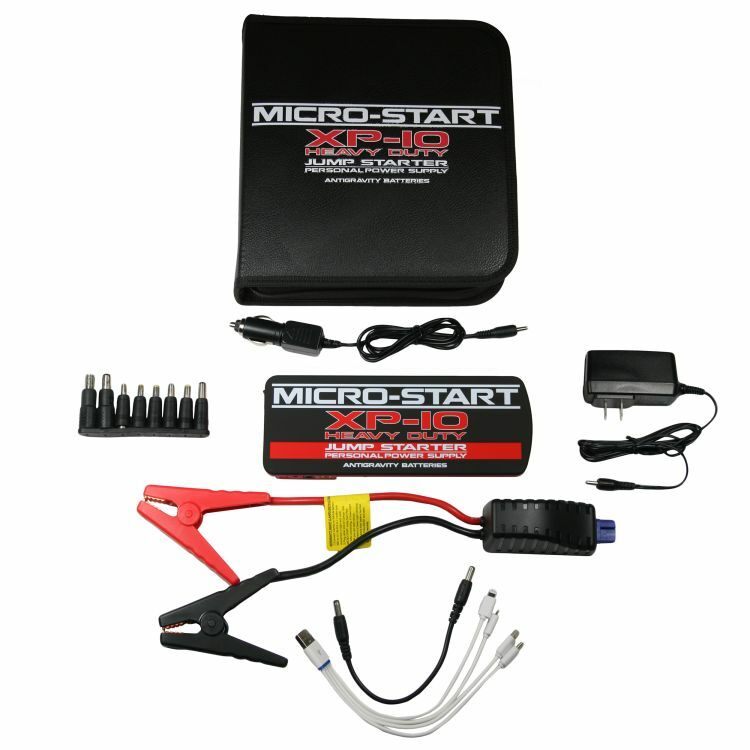 This is our MOST POWERFUL and TOP RATED Micro-Start PPS (personal power supply). Small enough to fit in your hand yet has the amazing power to Jump-Start DIESEL vehicles up to 7.3L, as well as gas engines. Charge & Power most any electronics: 19V Laptops, 12V Devices, two USB 5V Devices! 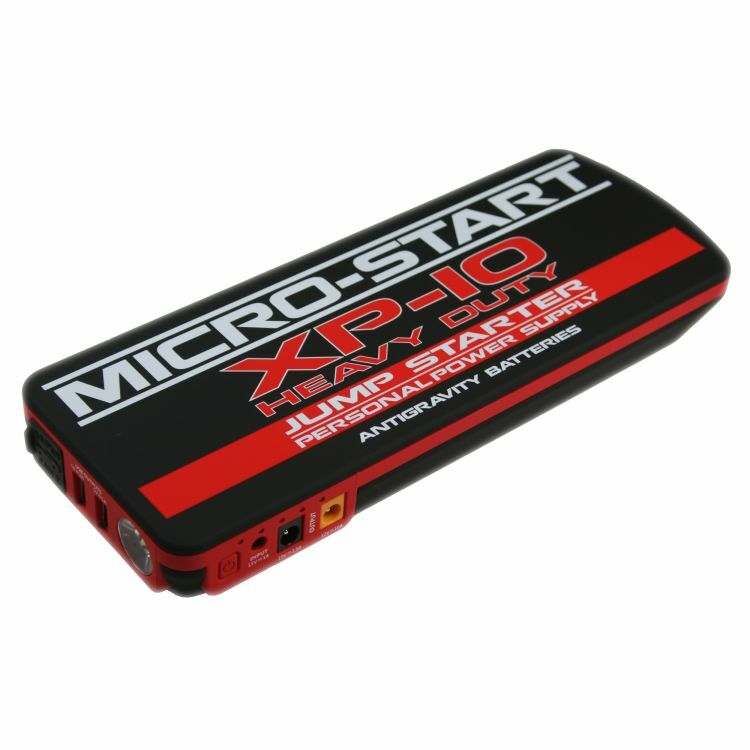 The XP-10-HD PPS is our MOST POWERFUL micro jump-starter & personal power supply. It is small enough to fit in your hand, yet so powerful it can JUMP-START DIESEL vehicles up to 7.3 liters, as well as Gas engines. Easily start Cars, Trucks, and Powersports vehicles. Amazingly it can also POWER & CHARGE Laptops, Tablets, GPS devices, Cameras, Smartphones and more. This model offers 2 USB charging ports in addition to its 19V and 12V charging ports. It has a very high capacity of 18,000 mAh and up to 650 Peak Amps for massive starting capabilities! The XP-10-HD is lightweight and compact (only 18 oz, 9 x 3.2 x 1.2 inches). It’s your own multi-function power supply to easily take everywhere or use daily at work. Whether you’re a professional mechanic or off-road explorer, remain confident that you will be able to start your vehicle, make that important call, or get that last bit of work done. The XP-10-HD even has a 3-mode hi-power 110-Lumen LED Flashlightbuilt-in, with 2 flash patterns including a S.O.S. flashing beacon. The Micro-Start is incredibly SIMPLE to use. Easily take back-up power everywhere. No need for an electrical outlet or a power station; the XP-10 is a self-contained battery jumper pack & device charger. The XP-10-HD comes in a convenient Carry Case with EVERYTHING you need to Jump-Start your Vehicles and Charge your Electronics no matter where you are. The Micro-Start XP-10-HD model comes with everything you need in a convenient carrying case. 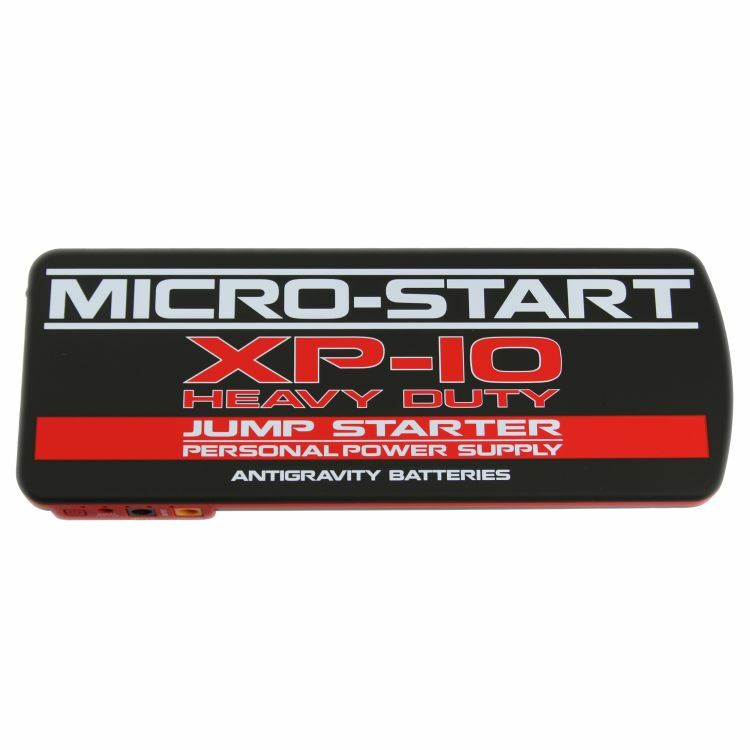 1 Micro-Start XP-10-HD (Heavy Duty) PPS. 1 universal 4-into-1 USB Cable (white). Tips: Mini USB, Micro USB, Apple 8-pin, and type-C.
DIESELS up to 7.3L, and Gas Engine vehicles: Cars, Trucks, Motorcycles, ATVs, UTVs, Snowmobiles, other Powersports Vehicles, Boats, other Watercraft. 300 Amps starting current – 650A Peak! 12V Devices: GPS, Mobile DVD Players, Small Fans, LED lighting and more. USB Devices: all Cell / SmartPhones, Tablets, Kindles, iReaders, GoPros, other Cameras, PSPs / Handheld Games, MP3 / Music Players, Bluetooth devices, etc. Rechargeable lithium battery. Recharge the XP-10-HD itself via wall outlet or vehicle cig lighter port. Do you own the AG-XP-10-HD? Please, tell us what you think about it. It helps us provide you with better products. Please note that it may take up to 72 hours for your review to appear.